Surrounded by wilderness and open space, early settlers developed and used land with little regard to controls. As New Jersey’s population grew, taking over the open spaces, leaders began to recognize the need for land use planning. Today, as a community in the nation's most densely populated state, Ocean Township has had to carefully plan for the use of its limited land resources. The ultimate responsibility for this planning lies with the Township Council, which faces complex decisions in balancing the needs of a growing population for housing, commerce, roads, and services with the impact of development on traffic, drainage, aesthetics, population distribution, life styles, natural resources, and the environment. Land use planning requires a consideration of natural features, an analysis of the ways land is used and would like to be used, and an understanding of the governmental controls over these uses. Ideally, achieving this balance would avoid traffic bottlenecks, separation of commercial and residential areas, vacant shops and office buildings, flooding, and excessive siltation. This chapter first discusses the natural and environmental features of the land as well as the way land is used today. 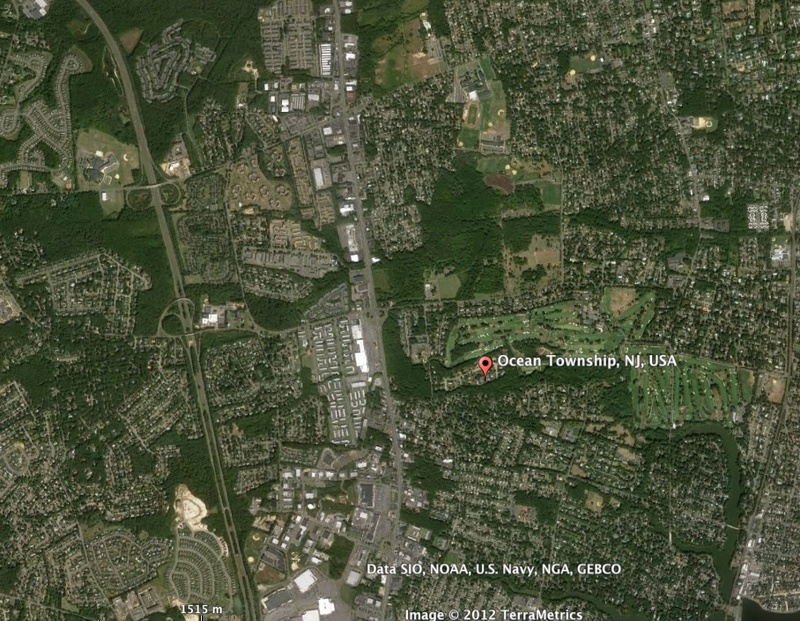 It then describes the governmental controls over land use in Ocean Township. The natural features that attracted the community's original settlers continue to lure residents and businesses. Ocean Township, situated less than one-half mile from the Atlantic Ocean, lies in the northern reaches of the outer coastal plain of the U.S. The township is largely flat, sloping from the sand hills in the western part of town down to sea level near its eastern boundary. The highest elevation in the town is about 180 feet in Wayside. The 11.1 square miles of the township are in four different watersheds. Most of the southern half of the town is in the Deal Lake watershed, with Harvey Brook and a smaller stream at the southern boundary being the main tributaries. Deal Lake is the largest coastal lake in New Jersey. Along the northern boundary of the town is Whalepond Brook, which flows into Lake Takanassee in Long Branch and then into the ocean. Between these two watersheds is Poplar Brook, which is the only stream in New Jersey flowing directly into the ocean. Finally, a small portion of the southwest corner of the town is in the Shark River Watershed. Within some of these categories, there are further divisions, all governed by zoning laws. Residential zoning, for example, varies from about one acre (R-l) plots to medium density one-quarter acre (R-4) tracts and to high density eighth-acre (R-6) lots, with attached housing in cluster zones. Additionally there are about 3000 units in garden apartments, mainly along Route 35. Commercial zones allow a variety of stores in neighborhood and highway settings as well as in regional shopping centers. In Ocean Township, industrial zones limit use to only light industries, and there are zones for office buildings. The two largest parks in Ocean Township are the 208-acre Joe Palaia Park and the 165-acre Weltz Park, which is part of the Monmouth County Park System and which extends into neighboring Eatontown. The other three large tracts of open space are the golf courses. The Colonial Terrace Golf Club is a public course owned by Ocean Township. Hollywood Golf Club and Deal Golf Club are both private country clubs. Lighting, which can spill off the site and cause glare at night. The Township recently adopted a pedestrian and bicycle plan that will encourage residents to walk and use their bikes along safe routes throughout the township. The plan addresses the shortage of sidewalks and bicycle lanes in the Township and has been incorporated into the Master Plan. Although the plan was developed by a professional consultant, the process used to create this plan should be used as the standard for land-use planning. The steering committee included elected and appointed officials, township professionals, and representatives from the Board of Education, the police, Monmouth County, and the New Jersey Department of Transportation. In addition, the draft plan was made available for residents to review, discuss, and comment. The Township is engaged in other environmental practices. The Township is a leader in recycling, collecting recyclables many years before the state mandated it. The Township’s Shade Tree Commission has an active program to maintain and replace the trees lining our streets. In addition, the Township practices integrated pest management on public lands to limit the use of pesticides. The primary responsibility for land use planning and control rests with the municipality. The New Jersey Municipal Land Use Law, first passed in 1975, encourages every local governing body to establish specific plans and procedures for the development of land within its boundaries. 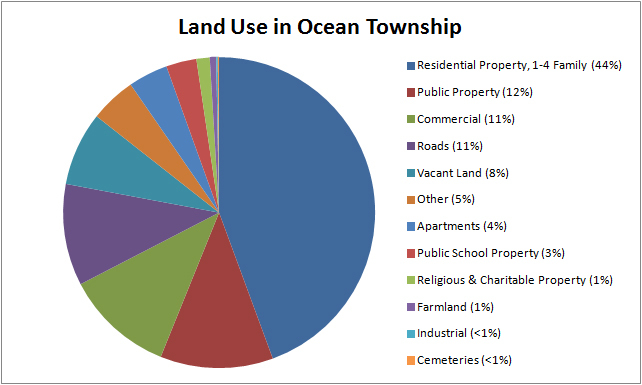 Ocean Township has a Master Plan for land use as well as specific land use ordinances, which are discussed below. The three bodies in the township that have primary responsibility for land use are the Township Council, the Planning Board, and the Zoning Board of Adjustment, also discussed below. Every level of government, however, exercises some control over the use of land in Ocean Township. For example, the federal government imposes restrictions on building in flood zones because Ocean Township residents qualify for flood insurance. Federal regulations also apply to any project that receives federal funds (e.g., the township Sewerage Authority). Besides passing the N.J. Municipal Land Use Law, which transfers the primary responsibility for land use planning and control to the municipality, the state government has enacted other laws affecting land use; for example, laws that regulate stream encroachment and soil erosion. The state also offers assistance to communities through programs like Green Acres, which provides funds to purchase and preserve open space. The role of the county government in land use is largely advisory. The county Planning Board devises a regional master plan for the county and encourages the municipalities to comply through their own master plans. Increasingly, the state is empowering county governments with the authority necessary to make their coordinating efforts effective. For example, the county has been given enforcement authority for soil erosion and sewerage treatment. Although land use is controlled by many different branches of government, local control is paramount. As described below, New Jersey’s Municipal Land Use Law gives significant control to the residents of a town through their appointments to the town’s various boards and commissions. Having such local control is an attempt to balance the needs of the residents with the needs of developers. This balance tries to maintain property values and the characters of neighborhoods while allowing the development and redevelopment of land, all with citizen input. The Master Plan in Ocean Township and in other municipalities is the document that guides land use. Developed by the local Planning Board, the Master Plan contains a description of how the land is currently used as well as proposals for future use. Master plans must have a statement of objectives, principles, assumptions, policies, and standards for land use based on the physical, economic, and social development of the municipality. The Master Plan must also take into account natural conditions (e.g., topography, soil conditions, drainage, flood plains, and woodlands) and show existing and proposed land use for various types of residential, commercial, industrial, agricultural, recreational, educational, and other public and private uses. In addition to addressing land use, the Master Plan also deals with housing, roads and traffic, utilities, recreation, conservation of natural resources, and historic preservation. The Township Council is responsible for enacting the laws and ordinances. Those ordinances controlling land use must be based on the Master Plan and must also conform to state laws. The overarching state law is the New Jersey Municipal Land Use Law. Developing and maintaining the Master Plan. Reviewing site plans and controlling subdivisions. Creating the Official Map to reflect the provisions of the Master Plan. Developing a zoning ordinance to limit certain buildings to specified districts; to regulate buildings according to their types, sizes, and the nature of their use; and to regulate the nature of the use of land for commerce, industry, residence, open space, and other purposes. Creating a capital improvement program for municipal facilities, such as roads. Providing advice to the Mayor and Council on land use matters, such as affordable housing and rezoning. Planning Board meetings are open to the public, and ample time is allotted during hearings for input from residents. The Zoning Board of Adjustment consists of seven members and four alternates who are appointed by the Mayor and Council. The board hears and decides appeals regarding variances or alleged errors in the enforcement of the zoning ordinance. Because the board members are residents, the board may lend a sympathetic ear to some requests for variances, while taking sterner positions on variances that might have negative impacts on homeowners. In Ocean Township, for example, development of an unusually shaped piece of property may require special consideration by the zoning board of adjustment because it does not otherwise conform to the particular zone in which it is located. Zoning Board meetings are open to the public, and ample time is allotted during hearings for input from residents. In 1971, Ocean Township established one of the first Environmental Commissions in New Jersey. The Environmental Commission acts as a watchdog for environmental problems and opportunities, informing and advising township officials and the public as needed. Environmental commissioners research issues, develop educational programs, and advocate for sound environmental policies, including open space preservation, smart growth, wetlands and water resource protection, recycling, wildlife habitats, energy efficiency and conservation, and transportation. Recently, the Environmental Commission was the lead organization in the Township for establishing the Green Team under the Sustainable Jersey Program and getting the Township certified in this ongoing program. Citizens can volunteer to be associate members of the Environmental Commission without being formally appointed by the Mayor to an open position. For more information on environmental commissions, see the Association of New Jersey Environmental Commissions. To promote and maintain the look and appearance of Ocean Township, the Shade Tree Commission regulates the planning and care of shade trees on public lands in the Township, including parks and along the roads. The purpose is to sustain the community shade-tree forest that will keep the aesthetics and quality of life for the residents. Members of the Shade Tree Commission are appointed by the Township Manager, although residents may also volunteer as associate members. For more information, see the state Divison of Parks and Forestry's Community Forestry website here. The township’s professional staff implements, expedites, and enforces land use procedures, policies, and decisions. The staff includes a planning administrator, a professional engineer, a land-use planner, and several code officials. The planning administrator functions as an intermediary between applicants and the land use boards. The administrator processes the documents submitted by the applicant, coordinates the reviews of the professional staff and the environmental commission, and communicates their comments to the applicant and to the boards. The administrator must have a degree in planning. A licensed professional township engineer serves as technical advisor to the manager and council, while the Planning Board and Board of Adjustment appoint their own professional engineers. The engineer prepares designs for drainage, roads, recreational facilities, and other public works; and the engineer reviews applications submitted to the Planning Board. The land-use planner, who must be a licensed professional, advises the Planning Board and Board of Adjustment, reviews applications as requested, and drafts the Master Plan and the zoning ordinances. All new construction and modifications to existing structures require building permits. The code officials examine plans and the construction for conformity to the uniform state building code, including electrical, plumbing, construction, and fire standards. The code officials also review all applications submitted to the Planning Board and the Zoning Board of Adjustment for conformity with the Township’s zoning ordinance, and the officials are responsible for enforcing the provision of the zoning ordinance on existing buildings.